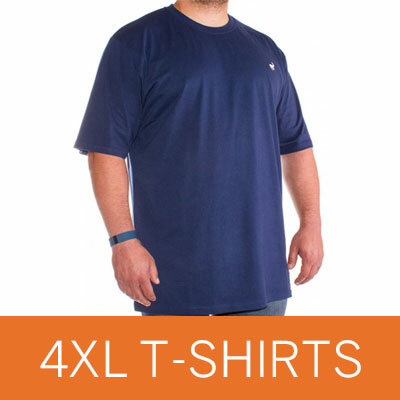 4XL is one of our most purchased sizes and as such, we ensure that our selection of XXXXL clothing is suitable for all budgets and tastes. 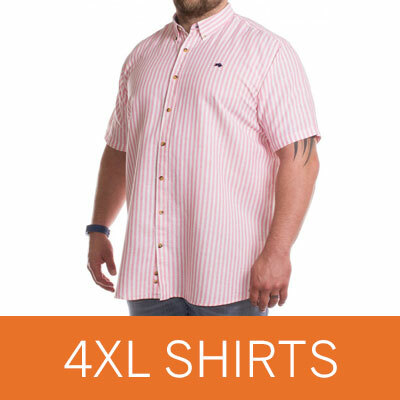 Whether you are looking for a new printed T-shirt, a pair of new jeans or want to add a new outfit to your wardrobe especially for that special event, Big Dude have a great range of garments available in 4XL from premier brands such as Farah, Lambretta and Metaphor, so take a look at our extensive choice available at great prices. At Big Dude, we are always adding to our selection of XXXXL shirts and try to offer a wide variety of styles in a range of different colours. Our large shirts come from many different brands too so you can be sure that our choice is unbeatable. Whether you are looking for a shirt in denim or 100% premium cotton, we have the perfect shirt that will make you feel great and look fantastic. Many shirts available are perfect for work, but if you are looking for a shirt perfect for a special occasion, check out Double Two and Rael Brook for formal shirts. Casual, everyday pieces also feature heavily and if you want a more relaxed style shirt, take a look at big name brands including Duke, D555 and Loyalty & Faith for less formal styles that look great paired with jeans or chinos. At Big Dude, we don’t think there is anything better than a warm and comfortable hoody and that is why our options in 4XL are always being updated. Whether you are after a zipped hoody or simply a pull over design, we have both available so take your pick! Along with hoodies, we also have a great range of 4XL buttoned cardigans, warm jumpers great for layering and gilets if you are looking for something lighter than a coat. Our big jumpers and hoodies are from top brands like Raging Bull, Ed Baxter as well as Duke and come in a variety of popular colours. Polo shirts are one of our most popular selling items here at big Dude so we continually strive to ensure that we are fully stocked with 4XL options to fit all tastes and budgets. Plain polo shirts have always been a staple piece, but more and more bold pieces are starting to become more popular, so check out brands like Loyalty & Faith as well as Santa Monica for brighter designs. 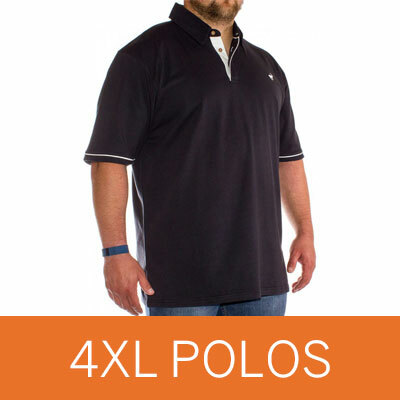 We continually add new items and brands to this category, so always keep an eye out for new 4XL polo shirts. Big Dude offer you a huge choice of 4XL jackets and coats and we are really proud of the range that we have to offer. Our XXXXL jackets and coats are on trend, fashionable and ideal for any conditions; all at unmissable prices. Whether you are looking for a light summer jacket, a thick winter coat or an all-round durable fleece from brands like Regatta, Duke or Ben Sherman, Big Dude have a 4XL coat for you! We have over 100 different styles of T-shirt available in size 4XL and this range is always expanding as we introduce more and more brands to our collection. Whether you are after a T-shirt with long sleeves, short sleeves, something plain or a patterned piece full of design, Big Dude have a great selection that is bound to have what you are looking for! 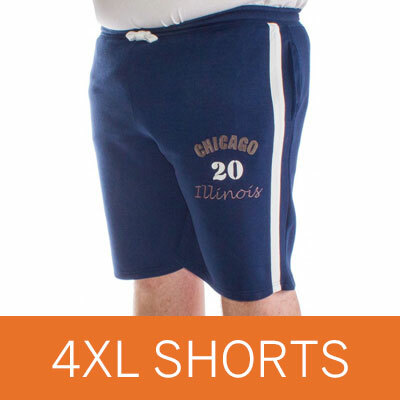 Big Dude have a great selection of shorts available in size 4XL, which cover all occasions. From bright and colourful swim shorts to smart chino walking shorts, the range is fantastic so you are sure to find a pair that you like. Our own brand Big Dude jogger shorts are one of our most popular pair of shorts and come in our most preferred range of colours grey, black and navy. Everybody loves a pair of joggers and at Big Dude, we’re no different! Comfortable, practical and great for lounging in, joggers are a great piece and a must have for any man in their wardrobe. Onsite, we always ensure that we have a big selection of 4XL joggers and try to include a range of different styles, colours and brands to suit all tastes. Our selection of 4XL underwear covers a variety of styles including briefs, boxers and trunks, so no matter your preference, we have a great pair of underwear for you. With top deals on brands like KAM, Jockey and Cotton Valley as well as our price promise ensuring you get new 4XL underwear for the best price, check out our selection of underwear online today. We are really expanding our range of suits, blazers and waistcoats at Big Dude due to the success of our original £99 suits and love the quality and range of items we currently have available. Whether you are after a two-piece suit for everyday wear, a blazer to compliment a shirt you own, or a waistcoat to add that extra something to your outfit, take a look at our range online.